Share the Rainbow: A Rainbow Brite Fansite Production Blog: Spring is here! Real-life mile stones are slowing things in the virtual world, but fear not my friends. I am working steadily on new stories! We finished the first episode of the Podcast a little over a week ago, but I'm already collecting new information for the next episode! Don't forget if there is anything you want to know about, just drop us a line at britecast @ gmail.com! Did you know we released the first episode of Brite Cast on the first day of Spring? It was almost fate. 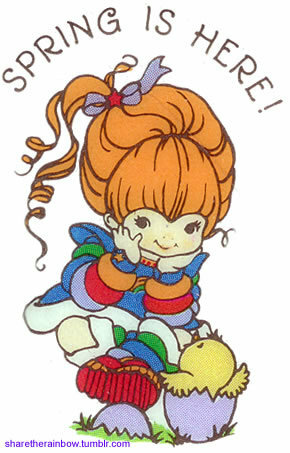 Almost every story or episode of Rainbow Brite began in Spring. We look forward to hearing from you about what you would like to hear about both on Brite Cast and on RainbowBrite.Co.Uk!